Albrecht Durer, 1471-1528, one of Germany’s famous artists in art history was the greatest printmaker and artist of his time. He made copies after Mantegna famous paintings and was influenced possibly by Martin Schongauer's "Temptation of St. Anthony", 1480-90, when he created "The Four Horsemen of the Apocalypse", 1497-8. While Schongauer's art "Temptation of St. Anthony" had a kind of static interaction of figures seemingly placed on a two dimensional frontal plane, Albrecht Durer's woodcut figures had a more dynamic active energy. The figures as well as the whole composition are articulated with the subtle linear engraving lines that add a three-dimensional quality, and volume to his artwork. 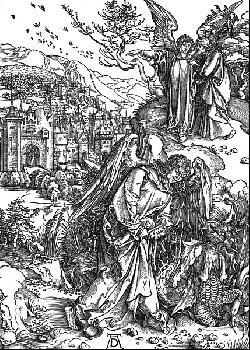 One of Albrecht Durer’s first successful artworks were a series of biblical woodcuts illustrating themes from the book of Revelations. Durer’s art fed the public interest in religious subject matter around the time of the Protestant Reformation. Albrecht Durer was a Christian humanist. In His finest art print, "Knight, Death and Devil", 1513, he developed a symbolic art composition of an ideal horse and rider, similar to ideal heroic poses of the High Renaissance art period. The rider is a Christian soldier.Through faith, he steadfastly travels along the road of life with his loyal dog, toward the Heavenly Jerusalem undeterred by the threatening devil carrying a pickax. The figure Death with its snakes holds up an hourglass as a reminder of time and the mortality of all living things. Durer's famous painting "Self Portrait", painted in 1500, belongs to the Flemish art tradition. It can be compared to Jan van Eyck's, "Man in a Red Turban" 1433. Both have solemn frontal poses with idealized features, and confident authority. Albrecht Durer painted two more of his famous paintings in art history when he painted two panels "The Four Apostles", in 1523-26. The panels are influenced by Masaccio and Piero della Francesca's grand, bulky, solid figures. On the bottom of each panel Durer paints warnings against the city government and the ultra zealousness of the Catholic and Protestant religions. Quotations from each the four books of the Bible are written on the frames warning against false prophets. Other famous artists of the Renaissance art period are Titian and Michelangelo. To view the gallery of Albrecht Durer paintings, click here.